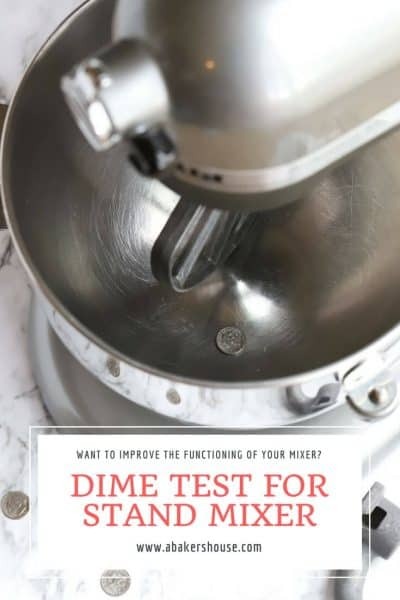 Did you know that there is a dime test for your KitchenAid mixer? 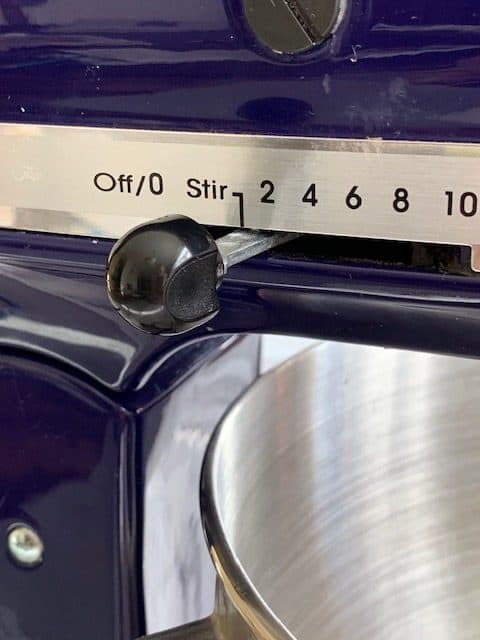 This simple step lets you calibrate your stand mixer and adjust the bowl clearance so that it works as efficiently as possible. All you need is a dime and a screwdriver to get your stand mixer in its best working order. There are two main types of Kitchen Aid mixers– the tilt-head mixer and the bowl lift mixer. Both names are good descriptions: the tilt-head mixer literally tilts up and back when you need to access the contents in the mixing bowl. There is a lever you push on the head of the stand mixer that either locks or unlocks the position, and you are able to tilt the head up and back. The tilt-head mixer currently comes with bowl sizes of 3.4, 4.5 and 5 quarts. The bowl lift mixer has a handle on the side of the stand mixer which you rotate to lift or lower the bowl. The bowl list mixer is offered with bowl sizes between 4.5 and 8 quarts. 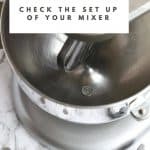 The mixer that is right for you will depend on your preference for stand mixer size, how often you will use the mixer, what type of foods you’ll make with your mixer, and how large of a batch you make while using your mixer. 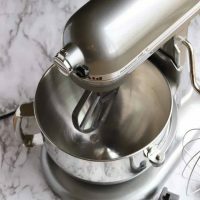 No matter what type of mixer you use, you’ll want to make sure your mixer is functioning at its best. 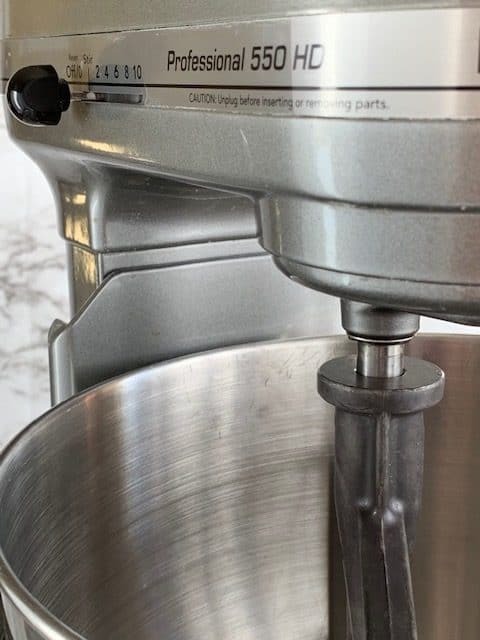 If you’ve noticed that ingredients are not being well mixed then you may need to adjust your KitchenAid mixer with this simple tip. This may be due to the height of your mixer paddle. 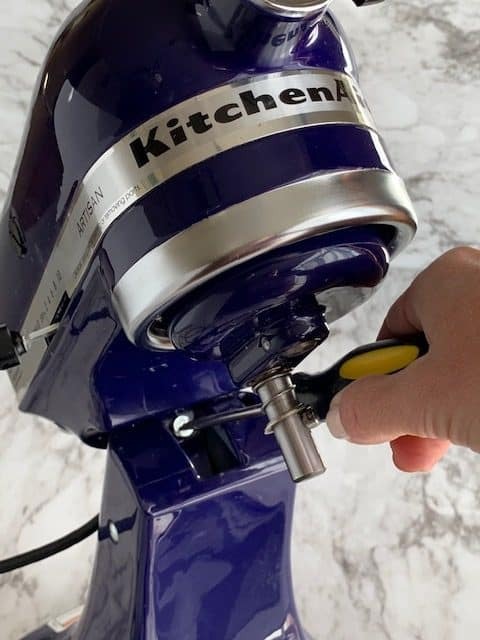 Did you know that there is an easy dime test for your KitchenAid mixer that you can do to see if your beater blade is in the right position for its optimal performance? 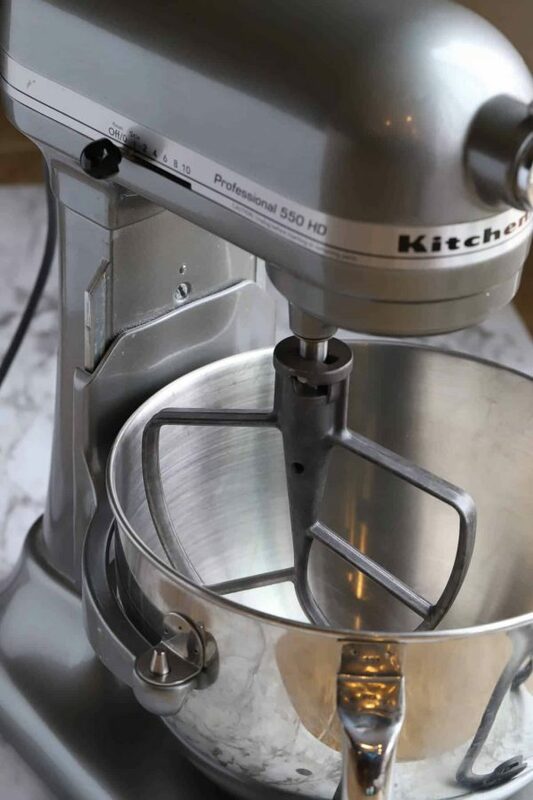 You may need to learn how to adjust your KitchenAid mixer. All you need is a dime. Why a dime? A dime is approximately 1/16 of an inch thick. This is the amount of clearance you are testing between your paddle blade and your bowl. 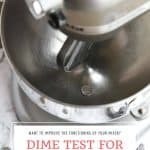 How do I do the dime test for my KitchenAid mixer? Place a dime in the bowl. Turn to “stir” or low speed. Watch how the dime moves around the bowl. Use a screwdriver to adjust the height of your blade accordingly. Put the dime in your bowl and turn it on to “stir” or low speed. You hope that your beater blade will gently nudge that dime around your bowl about 1/4 inch to 1/2 inch each time. Did mine? No—not even a whisper of movement on the dime! The Kitchenaid mixer paddle to bowl clearance can be adjusted very easily. Unplug your mixer first. It also helps to remove the blade to access the adjustment screw. Find the adjustment screw and turn it 1/4 rotation in either direction to adjust the height of the blade. Think of a clock face when you plan your 1/4 rotations. Picture the hour hand of a clock pointing to 12 o’clock. A quarter turn to the right would place the hand at 3 o’clock. A quarter turn to the left would place the hand at 9 o’clock. If your blade is too high, turn the adjustment screw 1/4 turn to the right. Conversely, if your mixer paddle is too low, turn the adjustment screw 1/4 turn to the left. You are changing the distance between the blade and the bottom of the bowl. Plug the mixer back in and repeat the dime test to see how the mixer’s function has improved. On the tilt-head mixer, the adjustment screw is not immediately visible when you are using the mixer. The adjustment screw is NOT either of the large black screws on the top sides of the mixer head. Please do not remove these screws. 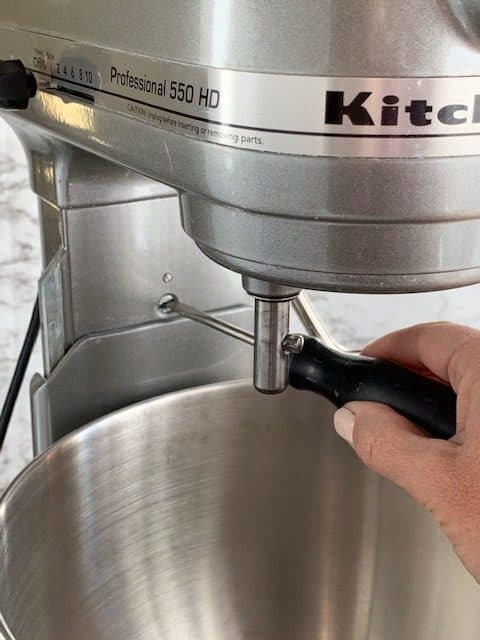 Tilt back the head of the tilt-head mixer and you’ll reveal the adjustment screw that will allow you to raise or lower the height of your mixer blade. The adjustment screw is a silver screw. Now let’s looks at the bowl lift stand mixer. Again the adjustment screw is not visible while the stand mixer is in use. Once you rotate the handle on the side of your lift bowl stand mixer, you’ll see the silver adjustment screw. Use a screwdriver to turn the screw 1/4 turn to the left or to the right as needed. Be sure to unplug your mixer before you make any adjustments. Remove the blade before making adjustments to make accessing the screw easier. 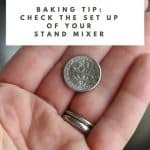 I’d love to hear if you’ve had any luck with this tip for the dime test for your KitchenAid mixer. Do you use the standard mixer blades or do you use the flex mixer blade? I was really excited to receive a KitchenAid mixer for Christmas a few years ago. 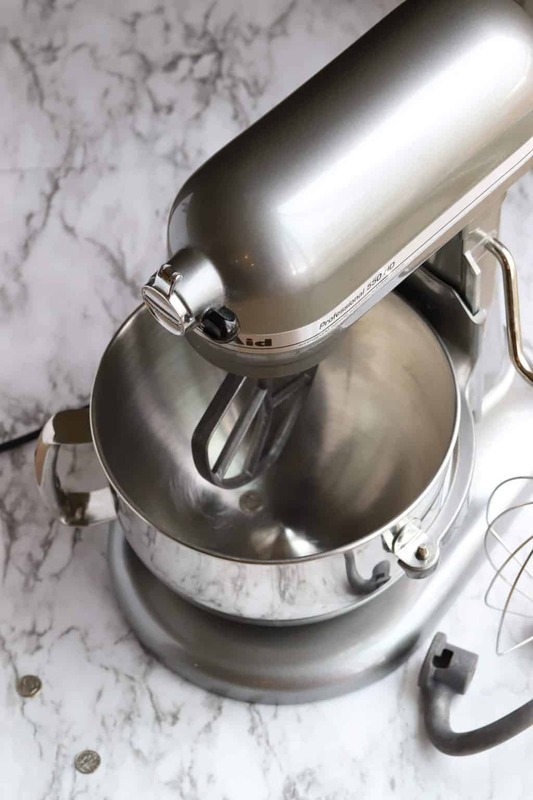 I envisioned plans of freshly baked bread, batches of cookies, and delicious cakes all to be made with this mixer. Has that happened? Well…no, not exactly. I have used the mixer frequently but not as often as I intended. I get frustrated that I am forever stopping the mixer to clean the sides of the bowl with a spatula and to give the batter a quick mix to incorporate the bits that the mixer has missed. Can you relate? I’ve seen advertisements for a special mixer blade that has softer edges that will scrape the sides and bottom of the bowl more efficiently. I found one at Homegoods recently but once it was in my kitchen I realized it was for a smaller bowl (4-5 quarts and mine is 5.5). I found this one online and have LOVED the results. A flex mixer blade has given my KitchenAid stand mixer new life. Be sure to buy the blade that fits your model of mixer. 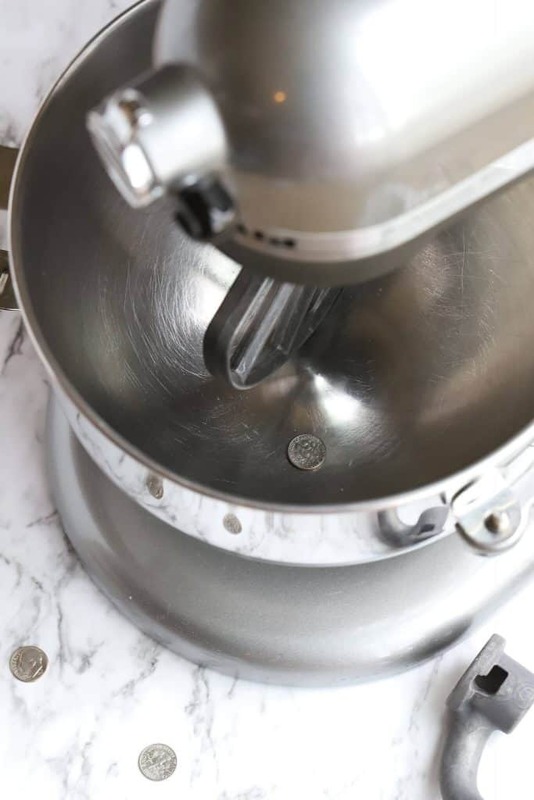 Use a dime to do this quick and easy test to see if your KitchenAid mixer is performing its best. Turn to "stir" or low speed. 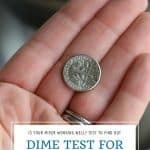 A dime is 1/16 inch thick which makes it the ideal size for this test. Other coins may not be precisely 1/16 inch. Please note that we are a participant in the Amazon Services LLC Associates Program, an affiliate advertising program designed to provide a means for us to earn fees by linking to Amazon.com and affiliated sites. 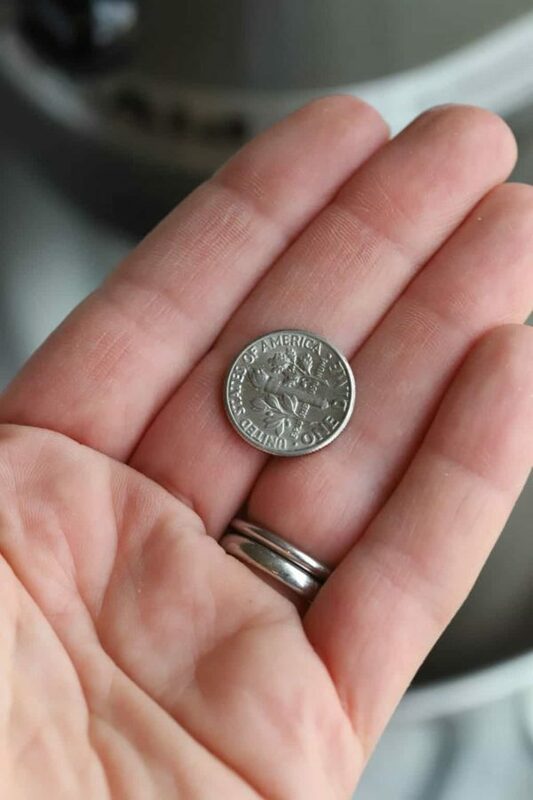 Pin this tip for the dime test or your KitchenAid mixer for later! Now that you have your KitchenAid mixer functioning at its best, here are some recipes you’ll love! Please note that this post was originally published in April, 2012; it was updated with text and photos in 2018. I have one and I absolutely LOVE it! It is the one made by Kitchenaid. It was a bit pricey, but worth every penny! So glad that you like yours by KitchenAid. Thanks for stopping by! Thanks for posting this. We were just discussing this on a message board I am on, and it is a common occurrence that people don’t know their mixer is set right. Thanks for your comment, Kim. I’d love to learn more about the message board you are on, is that on a cooking site? I have one of the rubber sided mixing paddles and I love it! I’ve never done the dime test, but all seems fine to me. I’m a huge Amazon shopper and got my paddle there. Thanks again, Karyn, for the Liebster honor. That was so kind of you! I am going to find a rubber sided paddle to fit my mixer. Thought I bought the right one a few weeks ago but it was for a smaller bowl. Back to amazon I go! Thanks for that advice. I will definitely find one made by KitchenAid. Mother’s Day sounds like the perfect reason to buy one too! I never knew this! My KA is ancient but I’m still going to try it. Hope you are having a great summer. Will chat soon! Hi Abbe, hope to see you soon. Boys are back at school in two weeks. Crazy how quickly the summer has gone. Hope you are doing well! I’ve had my KA for years and always loved it!! The only complaint I have is that my machine goes from 0 to 2 speed. I don’t have the “stir”. What should I do? I would suggest trying it at a low speed. The “2” should do it! Thank you so much for posting this info. This very thing has been a problem for some time. I have a 40 year old mixer that I love. I am so glad this may have helped! I hope my mixer will last as long as yours. Happy Baking! Thank you so much for posting! I had NO IDEA there was any kind of adjustment for my beloved mixer, and I’ve wished for years now that I didn’t have to lift the paddle to scrape the bottom. Lol. I am so glad you found this useful! You still will likely have to lift the paddle to scrape the bottom but this adjustment will make the mixer more efficient. Happy baking! Thank you SO very much for this helpful hint. I have been fiddling with my mixer for months and couldn’t get it right. Now I know which way to turn the screw and what the end goal is supposed to be. I immediately got up to try it and it was an amazing solution. The only problem is that as soon as I sat back down in my chair my husband said, “aren’t you going to bake something now so we can try it out?” Ha! Ha! That is fantastic news! Thanks for sharing it with me. Can’t wait to hear what you bake next! I tried to adjust my KA Lift Mixer, but the screw will not turn any further and it still will not move the dime. It seems to need to lower just a little more. What can I do? I would contact KA to ask them for advice. You don’t want to force anything that would damage your machine. Let me know what you find out. Hello I have the exact same problem as Brenda! When my screw is all the way to the left it only turns about 1/6 turn until it can go no further to the right. I havent called KA yet but wondered if Brenda or anyone else found a solution. Hi, thank you for posting this. I just did the dime test and I had to adjust the screw a full turn to get it to move the dime. That would explain a lot on why it wasn’t getting all the ingredients mixed in with my cookies. Great tip!! Hi Linda, I am thrilled to hear that you made an improvement! Happy Baking! 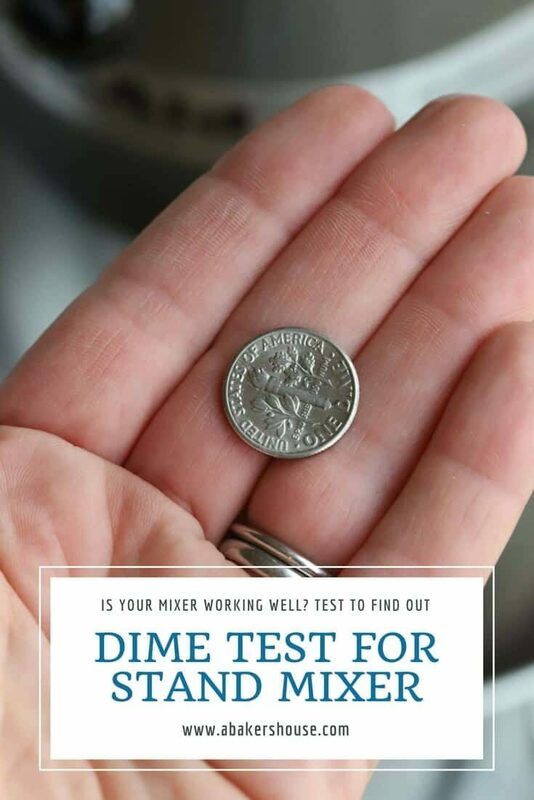 I can not wait to try the dime test but wondered how I know what size bowl my mixer has. I love my mixer but have the same problem of it not cleaning the sides of the bowl I bought a scraper paddle but it doesn’t really help. What type of mixer do you have? Classic? Professional? Are there any labels on it that might indicate the model you have? Send me an email with a picture if that makes it easier. Some models have the size of the bowl marked on the underside of the bowl– K5 or K4 for example. I can’t wait to try this! I have had my KA for YEARS and the only complaint I had was that I never thought the whisks and paddles ever got close enough to the sides of the bowls. Recently I have even been thinking of replacing the unit because of this. I REALLY hope this works for me. This tip could save me a bunch of money! Thanks for sharing! I hope this is the solution for you! Have you tried the flex beaters — they reach the edges better for me and I use that paddle most of the time.